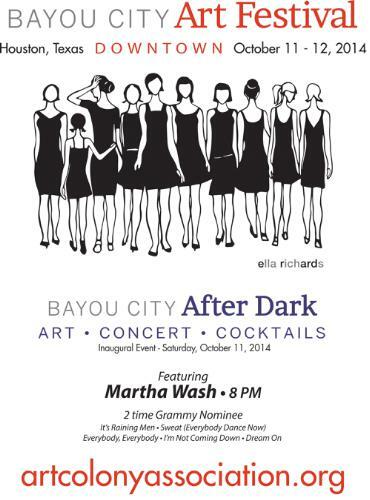 HOUSTON, Sept. 24, 2014 /PRNewswire/ — Bayou City Art Festival Downtown 2014, produced by Art Colony Association, proudly introduces “Bayou City After Dark,” a can’t miss downtown destination event. 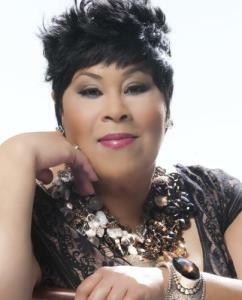 Enjoy fine art, drinks and live performances by Martha Wash of The Weather Girls, C+C Music Factory and Black Box fame, as well as Grady Gaines & The Texas Upsetters on Saturday, October 11, 2014 from 5 to 9:30pm. With Houston’s iconic skyline as a backdrop, 300 national and international juried fine and visual performing artists working in 19 media will turn Downtown Houston into an entertainment mecca from 10am to 9:30pm on Saturday, October 11 and from 10am to 6pm on Sunday, October 12. Discounted, advance tickets are on sale now through September 30, 2014 at http://bit.ly/1spW6kV. Known to many as “the Queen of Clubland,” Martha Wash is the voice behind some of the most well-known pop hits of all time, including: It’s Raining Men, Sweat (Everybody Dance Now), Strike It Up and her latest singles, Dream On and the I’m Not Coming Down Remix. Kicking off the evening is award-winning Grady Gaines & The Texas Upsetters who recorded numerous classics, with Little Richard including: Long Tall Sally, Send Me Some Lovin’ and Whole Lotta Shakin’ Goin’ On. NOMAD Sound of Austin, Texas will debut live painting and architectural video mapping performance pieces, projected in real time onto Houston’s downtown buildings.